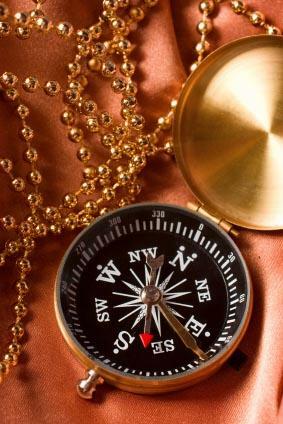 Compass jewelry has been around for centuries. Today people choose this jewelry as both a symbol and a statement. The large variety of pieces in art and fashion jewelry will appeal to both the jewelry collector and the trend setter. Compass jewelry features the navigational instrument as either a decorative or functional object. However, some styles feature the Masonic logo, which consists of the geometry math compass and a square. Where Can I Buy a Chinese Bagua Coin Pendant? The metaphysical symbolism of the compass relates to this tool's earliest known use. The origin of the compass dates back to ancient China during the Qin dynasty around 221-206 BC. The early versions served as fortune telling and Feng Shui tools. The first compasses used lodestones. During the Qin dynasty, Chinese fortune tellers incorporated lodestones in their fortune telling boards. The lodestone is a magnetite mineral that contains iron oxide, whose natural magnetic properties align in a north to south direction. An early inventor created a compass device consisting of a lodestone floating in water that pointed north and south for Feng Shui and astrological purposes. By the fourth century, people devised another version that used a lodestone as the directional pointer on an iron slab with constellations and cardinal markings. Modern metaphysical jewelry featuring forms of navigational compasses often relates to the four directions of north, east, south, and west. The four directions were significant to the ancient Celtic and Chinese cultures. A person might wear this type of jewelry as a symbol of being at harmony with the four directions or a symbol actively seeking balance in their lives. Masonic jewelry often features the universal symbol of Freemasonry: the math compass and square. In Masonic history, these functional tools of stone masonry symbolized the tools that together create perfect lines and angles with God's direction. They are also symbols of the wisdom and virtue that Masonic members strive to achieve, with the compass marking the boundaries. Freemasonry jewelry always features the square and compass emblem. Masonic jewelry includes rings, pendants, pins, and cuff links. Compasses are also found in religious jewelry. Muslim necklaces and bracelets may guide people in their daily prayer efforts. Christian jewelry may feature compass symbols around crosses. Neopagan jewelry, such as pendants with compasses and astrological symbols, is sometimes for both adornment and function. Fans of this jewelry can find many modern or antique style jewelry designs for casual or dressy occasions. The Compass Company: The Compass Company specializes in compass theme gifts, including designer compass jewelry. Eve's Addiction: The Eve's Addiction site has compass necklaces. Amazon: Amazon has a large selection of compass theme jewelry in a variety of styles. Cosmo's Moon: Jewelry designer Maureen Brusa Zappellini offers a unique handcrafted jewelry, including a compass bracelet. People of every walk of life can find compass jewelry to fit their style. Whether you seek symbolic jewelry, collectibles, or fashion jewelry, showcasing this symbol can be meaningful and unique.